Well I’ve heard of the tribal saying it takes a village to raise a child, I think this is concept embraced by birds. Well ducks at least, or at least our ducks (and hen). We recently left 3 of our resident hens (of the duck variety) sit on their clutches. After 5 weeks the first successfully hatched hers. Which I reported my joy, at the time as she was the first to nest initially, but was unsuccessful last time round. Well since then we have an additional 4, from another Mum. The third discarded her nest to take on the mothering of the first brood. 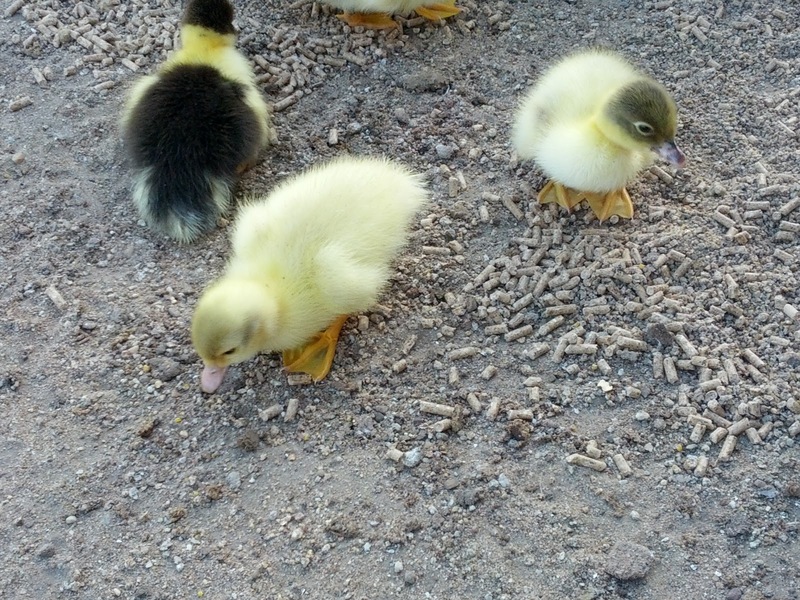 THis duck was the only one to sucessfully hatch her clutch last time, only for her to lose them a week later. Something that still concerns me. Their actual mother who sat on the hatching nest is a very relaxed Mum, allowing much of the mothering to be undertaken by the second duck or the hen. The hen is never far from the brood, no matter which Mum they are with and she is exceptionally protective. 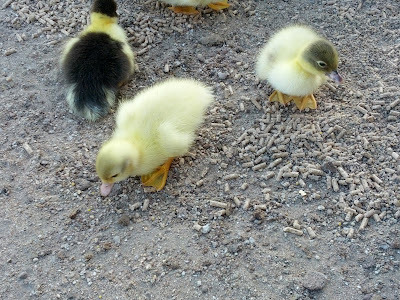 Something I hope will see these ones make it to adulthood. Although she is another species it is understandable that she watches these as if they were her own. 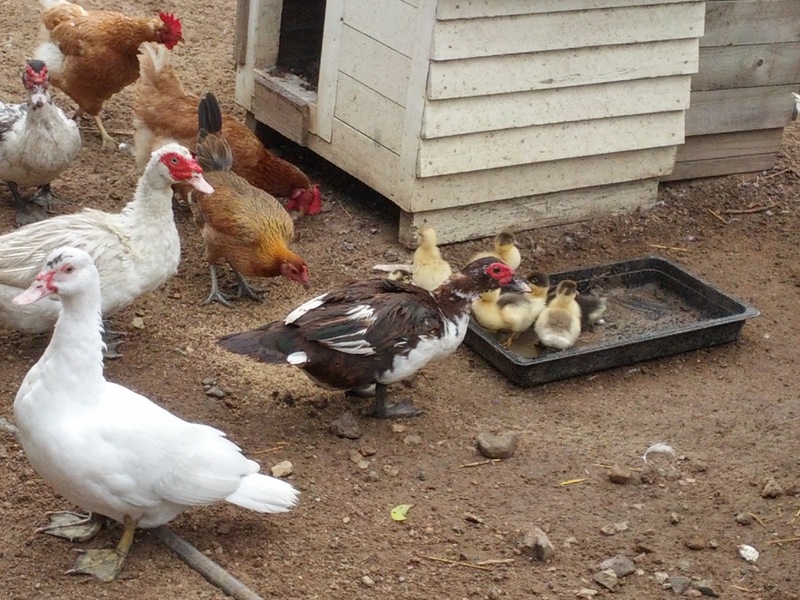 Chickens are renowned for being broody, this is due to their maternal instincts. This particular chicken hen actually shared the nest with the duck, throughout their incubation. More often than not I would take food into the shed for the sitting Mums and it would be the chicken sat on this clutch, whilst the duck went to feed with the other bird, so she is partially responsible for their existence. Well so far her 6 ducklings are doing well. They are adventurous little things, and not afraid to use their initiative. I have found 2 or 3 in the Indian game chick enclosure helping themselves to food on a number of occasions. This in itself involves leaving mum I the chicken/duck run, crossing a few meters of the front garden and invading another species food source. The problem with this is that we found one tangled in the wire- as they are growing rapidly and are now not fitting through the mesh. This little one Matt brought in, as it had lost use of its one foot. Though with a little time it regained some use, so he returned it to the flock. Only for (actual) Mum to pick it up by the neck and throw it, and then continue pecking it… it was clearly being told off. We were about to go and retrieve the little on, but she did not persist any more. On another occasion, I assisted 2 back through the fence, as the dogs were out. Only to be attacked by (foster) Mum and aunty hen. Now the second brood have remained under the protective guard of their actual hatching Mum. She is far more attentive (and aggressive) than the other Mums. Though she is more accepting of me being close than Matt. Her young do tend to follow the other brood and then panic when she is not close. 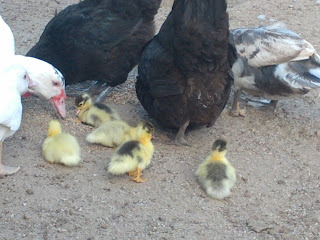 And are more reluctant to take attention from either of the other mothers (or the hen).